Heels on the harness boots are 1 lift (¼" / 6.4mm) higher than Wesco Boss at 2¼"
Production time for these custom made to order boots is currently running about 14 weeks . Leather Lining - Heavy 4 Ounce / 1.6 mm leather: black, tan, brown, tobacco or platinum. All Wesco boots are leather lined in the foot area. This option adds leather lining to the boot shafts. Extra ¼ inch / 6mm thick leather or EVA rubber midsole. Leather is stiffer, EVA rubber is more flexible and lighter. The classic harness boot is modeled on the square toed boots which were prevalent in the 19th century. Abraham Lincoln wore square toed boots as did many soldiers who fought in the US Civil War. The harness straps and rings were added in the 1960s and the style soon became a classic. These boots are not only sturdier than other harness boots you've seen, we think they're the best harness boots ever made. These harness boots come in a more limited range of sizes than other Wesco boots because of their special last. 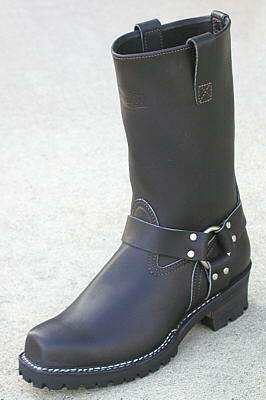 Click here to see a table of available sizes for custom harness boots. If you want a harness boot outside of the size range available for square toes, (or just want to be different) we can make these boots for you with the same round toe last used for the Wesco Boss boots. All other details would be the same as these square toe harness boots. These boots can't be made with steel toes because steel safety toes aren't available for these square toed boots. The black boots come with nickel (silver colored) rings, rivets and buckles while the Redwood and Brown leather boots use brass. But you can tell us to do this differently... they're custom boots after all. Customers who specify brass rings and nickel buckles (or vice versa) may be be issued a fashion citation. 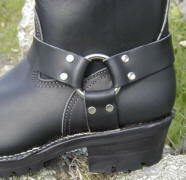 WESCO constructs these boots on lasts expressly designed for producing high quality harness boots. The foot area is lined by a smooth inner leather layer which contributes to the strength and comfort of the boot. This extra layer of leather complements the careful fit and excellent arch support. Our new customers are often surprised when they discover how comfortable these sturdy boots are! placing an order. Hit your browser's "Back" button to return here. If you need a size outside this range we can have your boots built with the round-toe lasts used for the Wesco Boss Engineer boots but all other details will be the same as these square toe harness boots. See the size tables below for the sizes available with the two round-toe lasts. "new" round toe with the sleeker, dressier, slightly lower and more dressy toe. The boots can be made in any size / width combination shown in green above. traditional "old" #9109 last. The boots can be made in any size / width combination shown in green above. Your calf is the large muscle in the lower leg below your knee. Find the widest point on your lower leg and measure the circumference (distance around the leg) at that point. The table below shows the maximum calf measurement for each size of Wesco boots in Inches and Centimeters. This is largest size calf which will comfortably fit in this size boot. If your calf is larger than the dimension in the table, please choose the option to have the bootshafts made larger. We can have the shaft made up to one inch larger or smaller in ¼" increments. First, determine your foot size. Wesco boots used to run fairly large, but now run true to your US Men's size. 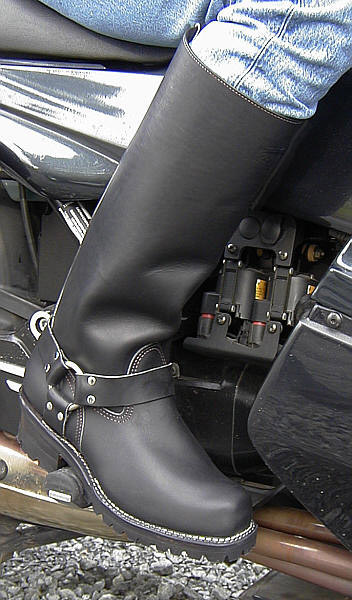 Order your Wesco boots in your true size or ½ size larger to accommodate heavier socks. Click here to go to the page which shows how to measure your foot to determine its true US Men's size and width. Enter the table with the boot size and note the maximum calf measurement for that size boot. See below for instruction on measuring the calf size. Measure your calves to ensure that they will fit the shaft. This should be done while seated. If you will be wearing pants tucked into the boots (best way to wear your boots! ), you should wear the pants or breeches you plan to wear with the boots and measure over the pants. You will need a measuring tape or you can use a piece of string then measure the length of the string with a ruler. Wrap the tape around the largest part of your lower leg (the calf). The tape should be comfortably snug but not tight. If this calf measurement exceeds the measurement in the table for your size, the standard boot shafts will be too tight for your leg to fit into the boots. In that case, please choose the option to have your bootshafts made larger. Next, check the height you have selected to determine where the top of the boot will be on your leg. Measure up from the heel of your stockinged feet along the back of your leg. This should be done while in a seated position with the knee bent at a 90° angle. New Harness boots will initially be at that position. e.g. if you order a 16" boot, it will come up 16" from your heel, but the boots could be higher... see the note below. Wesco warns that the initial height of Wesco pull-on boots, out of the box, can vary ±1" (±2.54 cm) from the specified height. In our experience, there's a high probability that your boots will end up somewhat higher than specified. We have not seen any which were lower. So, for example, if you've specified 20" boots with the expectation that they will be just at the bend in your knee after they are broken in, they could be up to an inch too high. So it's better to get your pull-on boots a bit under the maximum possible height. Finally, measure around your heel as shown in the diagram. This measurement should not exceed the calf measurement from the table or your foot would not fit through the shaft.